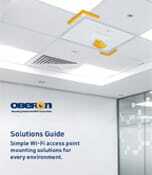 Oberon provides simple Wi-Fi access point mounting solutions for every environment. Oberon offers the widest selection of indoor and outdoor wireless enclosures and aesthetic mounting solutions for securing wireless infrastructure in virtually every venue. Oberon’s products are used where the RF coverage, infrastructure security, environmental robustness, and aesthetics are paramount in the network design and implementation. Your Wi-Fi network is mission critical. Oberon offers access point mounting solutions that protect the infrastructure, optimize wireless performance, and aesthetically blend APs into almost any environment. Take a look at the solution guide for an overview of products available. Your customers need solutions that are aesthetically pleasing, secure and easy to use and maintain. Oberon’s enclosures are designed with just that set of features in mind. Are you designing a new Aruba 802.11ax Wi-Fi network?